Used Vanna’s Choice (Brick & White) only because of the colors available for fox! 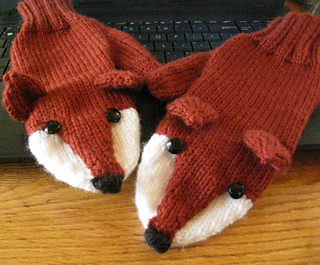 I knit tight…was able to get one large size and one small size with one skein of the fox color. NOSE/FACE JOIN clarification: 1st needle of black nose stitches are done by knitting 2 together. 8 stitches on front needle once flap is “loaded”: K2tog - 4 black stitches are on front; 4 on back. Load nose stitches between each white face loop, beginning with white, knitting 2tog first needle with black. (Seems to hide white best). Knit 3 rounds of black. Cut black leaving tail. Kitchner to close and then back stitch through all layers where black began to shape nose tip. Nose flap is sewn down with matching yarn after finishing black tips…be careful not to stitch through bottom layer of mitten! FOR LEFT HAND - 32 stitch count mitten errors… will update soon. After last F/B increase for thumb… Knit first stitch from Needle 1 onto needle 3. Row 11: (NOT 13!) Knit 30, Knit 2 together (above thumb join for added strength), Knit 1.